Adding data analytics to the mix to see more and make more informed decisions doesn't have to be painful. It should be fun and make you feel good. You know the value of your data, so what do you have to lose, or better yet, gain, by deploying an easy-to-use data analytics solution that can be tailored to your ERP industry and business? See the six commercial advantages that data insights can provide your product-centric manufacturing, distribution or retail business. Consider how with a data analytics solution such as Phocas, you can proactively influence the course of your business, whether it’s something that needs to be addressed today, next week or next year. 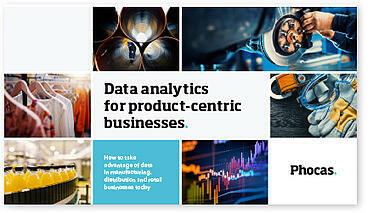 Fill out the form to download our Product-centric data analytics eGuide.